Stories from the community, statistics, events, and all about Open. Want to contribute? Let us know. 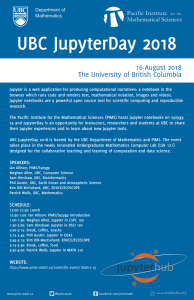 The Pacific Institute for the Mathematical Sciences (PIMS) and UBC Department of Mathematics invite you to UBC JupyterDay 2018! 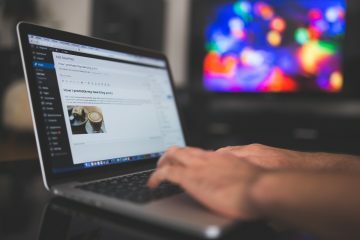 Jupyter is an open web application for producing computational narratives: a notebook in the browser which runs code and renders text, mathematical notation, images and videos. JupyterDay is an opportunity for instructors, researchers and students at UBC to share their Jupyter experiences and to learn about new Jupyter tools. If you are preparing resources for your teaching, from PowerPoint slides to online modules, chances are you’ll want to incorporate readings, images, video clips, problem sets, or other materials from different sources. This session will focus on the pragmatic elements of reuse, the essentials of copyright, and the basics of working with open educational resources that are licensed to allow revision and reuse. 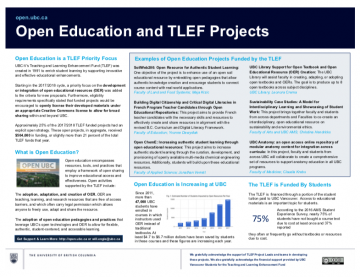 Such openly-licensed resources can impact teaching and learning through contextualization, time savings, and lowering student access barriers such as costs. 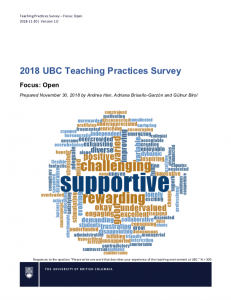 Please bring your questions and join us in exploring UBC’s Copyright and Fair-Dealing guidelines and how copyright intersects with effective teaching practices. For more information, please visit the workshop registration page. Call for Letters of Intent for Undergraduate Program Evaluation and Renewal projects and Large Teaching and Learning Enhancement Fund Transformation projects. 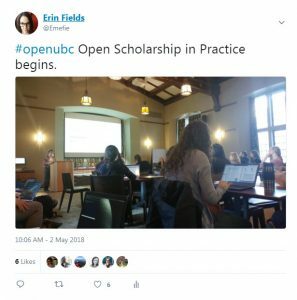 Proposals that address the creation or integration of open educational resources to make education more affordable and accessible to students are especially welcome. UBC-Vancouver's Teaching and Learning Enhancement Fund (TLEF) was created in 1991 to enrich student learning by supporting innovative and effective educational enhancements. Starting in the 2017/2018 cycle, a priority focus on the development or integration of open educational resources (OER) was added to the criteria for new proposals.